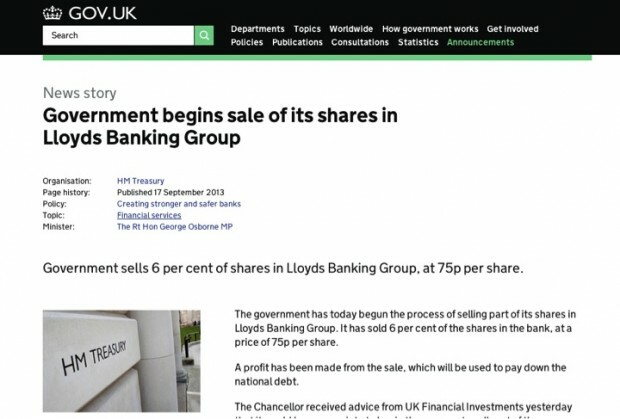 We’ve just started to look in a bit more detail about how users are interacting with news pages on GOV.UK. But we already have some interesting early findings, which we wanted to share. Our data is based on the 608 government news articles and press releases that were published in the six weeks between 11 August and 21 September. How many people look at news? News is a major source of traffic to GOV.UK. In the period we analysed there were 1.5 million visits to news pages - an average of 250,000 visits per week. Currently, around one in seven visits to the government section involves looking at at least one news page. In around two thirds of these visits the user landed directly onto a news article when they came to GOV.UK. What do people do after reading a news article? 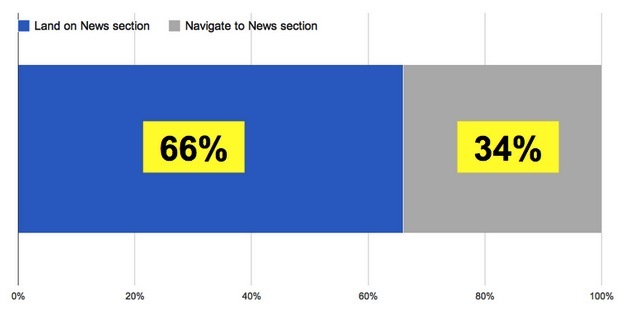 Our data shows that three quarters of users who land on a news page ‘bounce’ - i.e. they look at only one page and then exit GOV.UK. Unlike other kinds of pages, e.g. browse pages, this is not necessarily a bad thing as potentially users got what they came for and did not need to browse further. But to help us measure this in more detail, we’re hoping to develop some better interaction metrics which should give us a better picture of user engagement. More than half of visits coming to news articles come from search engines, with the majority from Google. 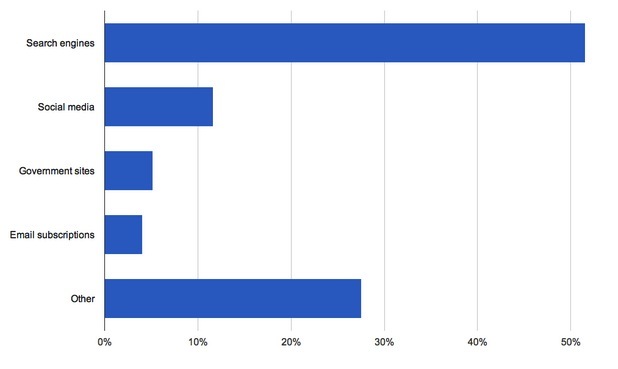 Social media activity accounts for 12% of visits, Twitter being the most popular referrer. 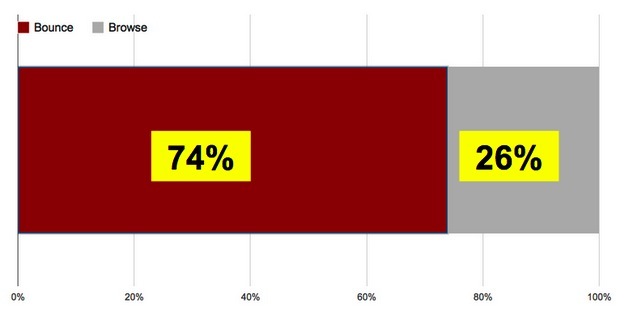 Most news articles and press releases have fairly low numbers of users. 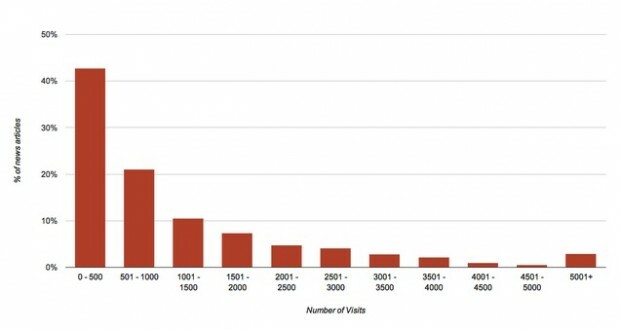 The majority of articles published receive fewer than 1000 visits - and most of these see less than 500 visits. However, a few news articles such as Brits caught out by unusual laws and customs do seem to attract a wider audience, getting more than 5000 visits. How long does news last for? One of the things we were keen on knowing is the average shelf-life of a news article and how quickly views decay over time. For many popular stories this is reasonably easy to estimate due to the topical nature of their content (a spike at publish followed by a fast drop-off). However, there does exist a number of articles that do not follow this trend. Dan Collins, our resident data scientist has written in detail how we did this analysis in a post which will be going live on the new GDS Datablog in the next few days. In the simplified model, it turns out that many articles get approximately 90% of their unique page views over the first 5 days since launch which agrees with our assumptions on how people view this type of content. These are obviously very early findings - but might prove a useful benchmark against which to analyse your news production. For example, if you find that a news article has a slower than average decay cycle, you might want to find out why. Or, if you’re finding that a higher than average number of people are coming to particular stories from social media, again that might be an interesting thing to explore the reasons behind. Please share your data if you find anything interesting. Thanks for the interesting post - especially interested in the shelf life/decay. We were pleased to see that the DFID news story on Typhoon Haiyan received very high viewing figures in November. We worked closely with colleagues in MOD, FCO and Number 10 so we feel pleased with the result. I'd love to know more about how people interacted with that page. Thank you for your comment. Within each department there is now an analytics SPOC (Single point of contact) who can assist with any granular queries you may have. The SPOC for DFID is Bruce Mackay who can be contacted on b-mackay@dfid.gov.uk.